Bright red and yellow color shades, mixed with various turquoise blue colors and dark gray color tones, create spectacular interiors. These beautiful, dynamic and impressive color combinations are for brave and adventurous, who appreciate exciting experiments with colors and strike to create unique and modern interior design. Lushome presents the bold color combinations inspired by exotic sunsets and turquoise blue waters. 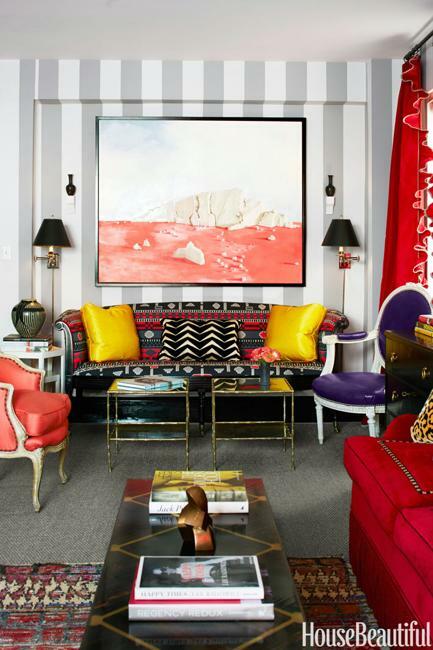 This home in New York has beautiful rooms decorated with bright accents. 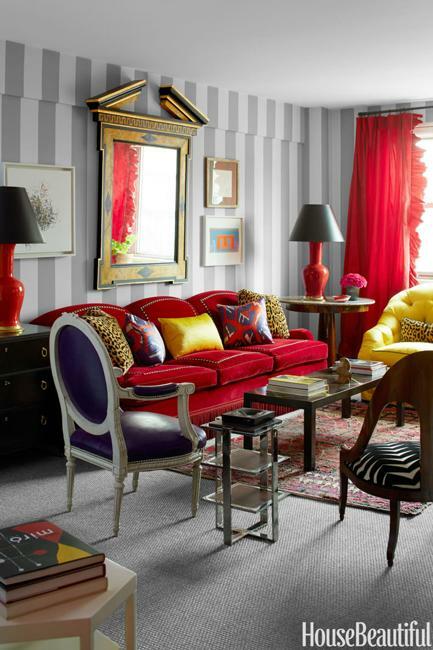 Fabulous color combinations of turquoise, dark blue, yellow, red, white and black add personality to interior decorating. Warm and cool color contrasts balance the color palette and give a fantastic look to all rooms. The color combinations are inspiring providing creative ideas for blending vibrant interior colors and designing fabulous home interiors which are intimate and bold. 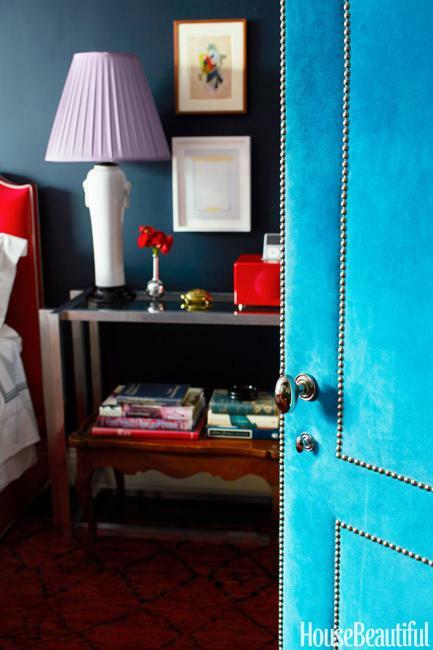 Vibrant colors turn the living spaces into surprising and exciting rooms. 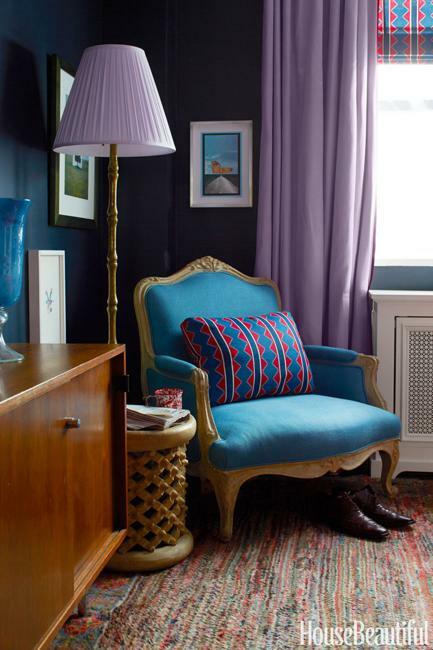 Mixing medium to dark turquoise, blue color tones and black with white, lilac purple, red and yellow gives a fresh, spectacular, and stylish look to the classy interior design with vintage decor. 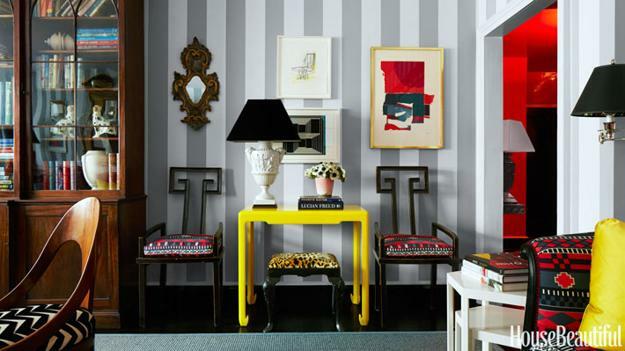 Stripes in neutral colors create an eclectic effect with bold decoration patterns. The result is surprising and impressive. Cute little things and a touch of light purple color create sensual and intimate interior design. 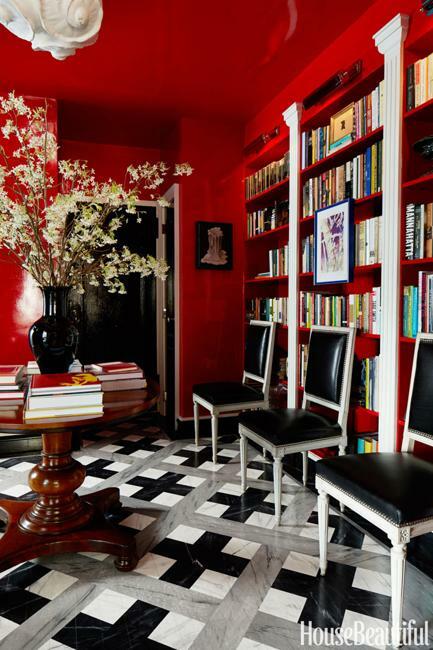 Gorgeous blue and white or black and white decorating ideas may look truly exotic and inspiring with warm yellow and vibrant red color shades. You need to be brave to add bright and sunny colors to noble blue or white and black. Inspired by warm tropical waters and spectacular sunsets, the interior design ideas feel comfortable and attractive. Room furniture and decor accessories in vintage style just increase the effect. Light gray and white decorating ideas bring fresh elegance into modern interiors. The stripes on the walls provide a beautiful background for displaying mesmerizing pieces, colorful artworks, unique furniture and Art Deco decor accessories. Medium to dark gray color and grayish blue tones are stylish interior design solutions for bedroom walls. Nick Olsen envisioned a Moorish arched headboard in red leather which is a striking focal point for bedroom decorating. 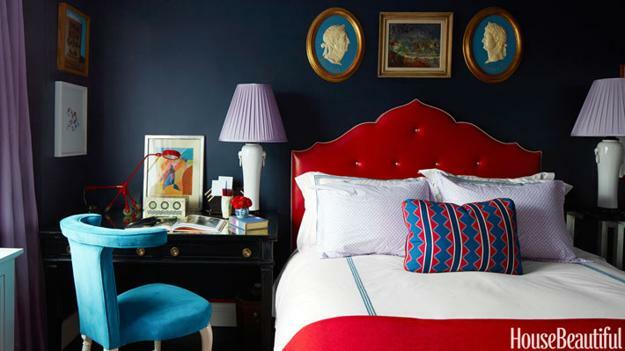 Vintage furniture in bright turquoise and white table lamps with lamp shades in tender lilac purple color look fabulous in the dark bedroom with red and white bedding. Original paintings on the walls, colorful tables, chair cushions, golden picture frames and a mirror in the vintage style set an atmosphere of elegant luxury and chic in the rooms with furniture in bright red, black, purple, and yellow colors. Red table lamps with black lampshades and black decoration patterns add sharp contrasts to the bold interior design ideas. The black kitchen is dramatic. A large window invites plenty of natural light balancing dark color tones and adding a spacious feel to the modern kitchen interior. 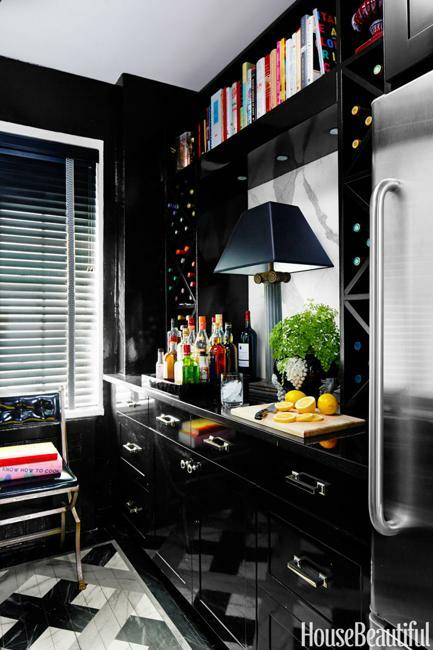 Glossy kitchen cabinets and metal details look stylish and impressive. The balanced color combinations of black and white with silver metal accents, cheerful yellow, vivid red and natural green colors create elegance and harmony. 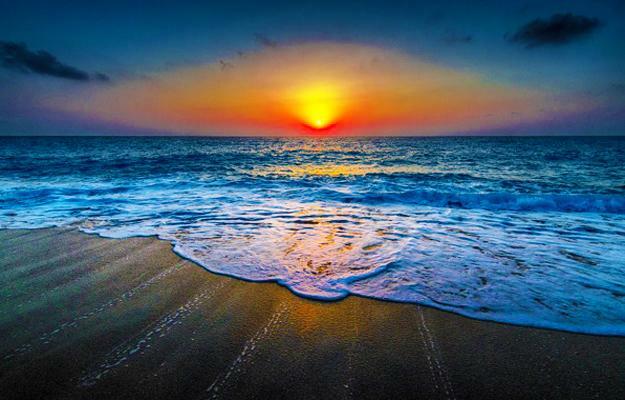 Turquoise blue colors perfectly match warm sunset hues. From light yellow and golden decorations to home furnishings in orange and red colors, room decor looks beautiful with blue walls and natural green accents.